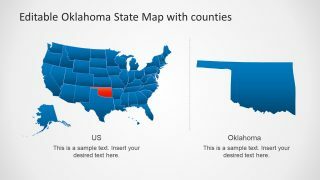 The Oklahoma State and Counties PowerPoint Map is an outstanding presentation, displaying the cartographic geography of the state of Oklahoma in the USA. 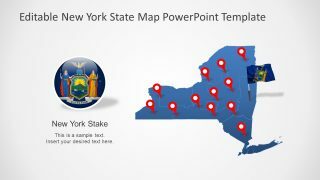 It is the perfect companion the the editable Map of US in PowerPoint, because it allows the presenter to drill down in this specific state. For example, a practical use case would be a company or individual demonstrating the business opportunity and market segmentation over the US, and then drilling down specifically for the Oklahoma segmentation. Oklahoma is the 20th largest geographically state of the US, with over 77 counties and 597 cities and towns. 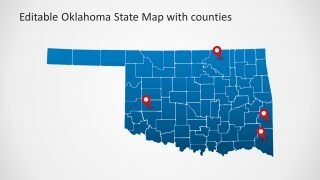 The geographic outline of the Oklahoma PowerPoint map and the division of its counties is shown through the use of white borders on blue shapes. 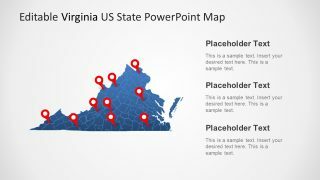 This template of counties has 6 creative slides with different positioning of the geographical map within the layout. 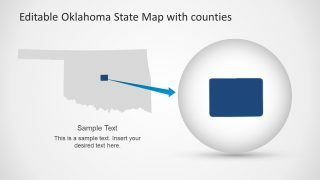 The Oklahoma State and Counties PowerPoint Map is an editable template. Created to quickly set-up a presentation with pre designed slides. 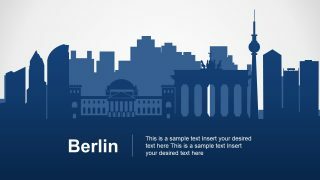 These are created with flat shapes, containing a collection of segments that compose the state PowerPoint map. These segments together create a complete geographical map of Oklahoma that can be un grouped, to work with the individual counties. Further, recolor the different counties of Oklahoma from the main map or re scale a county you want to highlight. 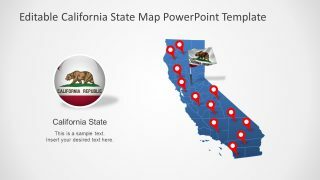 The customization of the PowerPoint map template with respect to colors and size of shapes is achievable in few simple clicks. For instance, select some county segments by pressing the Ctrl button and choose a desire color from the “shape fill” options to apply. Similarly, make several shade segmentation to show a range of demographic statistics. Such as, birth rate, literacy, ethnicity, business and industries. 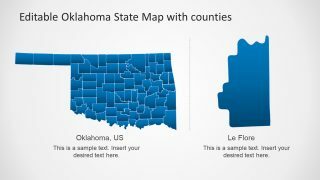 The presentation of PowerPoint map for Oklahoma state and its counties has a customizable sub-map of the US state. The Oklahoma PowerPoint map template contains clipart icons of GPS pointers. Moreover, the template has 6 different layout designs, the includes three different versions for highlighting counties. 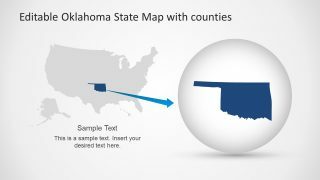 The last slide shows a roadmap template design of Oklahoma with the text placeholder to add title and detail information. This amazing United States map template also shows the complete set of American states along with silhouette of Oklahoma.